A simple grilled cheese can absolutely hit the spot, but even this classic can take to a few easy tweaks. Cory Ward, co-founder of Tom & Chee -- the national chain specializing in grilled cheeses and tomato soups, recommends that you always make sure you’re grilling your grilled cheese open face style. That’s especially helpful if you’re throwing in any additional ingredients, like bacon, tomato, or avocado (or, you know, all three.) Doing so will make sure the entire sandwich is just as hot in the middle as it is on the outside. And, technically, now it’s a melt. Phase 2: Secret weapon? Mayo. 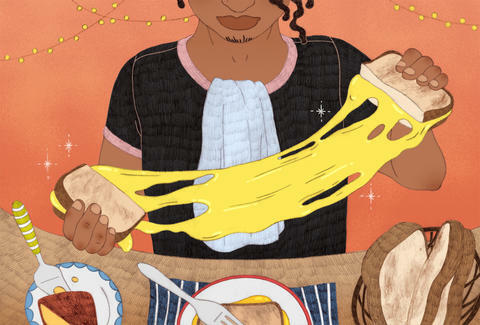 When you’re picking cheeses, Ward says American and mozzarella melt the easiest on a grilled cheese, while harder cheeses will be more difficult to melt. One cheese to avoid? Parmesan. It’s nearly impossible to get gooey on the inside of the sandwich -- but if you sprinkle it on the bread before you sear it, you’ll have an even tastier (read: cheesy) crust. 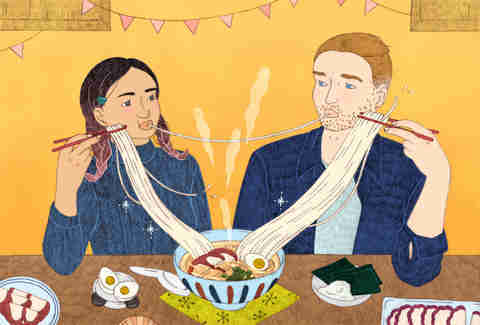 Ramen has the rep of being a college student staple, but let’s be honest, we all keep a few packages of the stuff around -- even ramen chefs, like Chef Julian Valencia at Ani Ramen in New Jersey. And while he makes the ramen as per package directions, he does get creative with what goes into it. First, he makes sure to use only half of that tiny seasoning package, as the label recommends. That way the broth doesn’t contain a month’s worth of your recommended sodium intake. To nix the MSG-laced broth altogether, he suggests mixing white miso paste into the broth to flavor it. It’s a common flavor for ramen broths at restaurants, and it doesn’t have nearly as much sodium or MSG. It’s known as sweet or “mellow” miso, and it’s got a delicate flavor. You can find it in the refrigerator section, near the tofu and kimchi, usually. To top off his ramen, Valencia stir-fries whatever vegetables he has in the fridge: everything from tomatoes, spinach, and scallions to one of those frozen bags of mixed vegetables. He uses some butter and soy sauce, but goes a little heavy on the soy sauce to offset pouring in only half the seasoning package. Then he tops the soup with two slices of cold cuts from the fridge and a hard boiled egg. Like the grilled cheese, you really can’t go wrong with macaroni & cheese (unless you’re lactose intolerant). 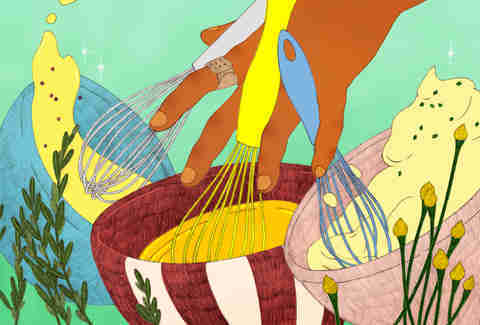 But before you go digging into the same bowl you used to mix the macaroni with neon orange cheese powder, take some advice from Marti Lieberman, the owner of Mac Mart, a mac & cheese-only restaurant in Philadelphia. Try using heavy cream instead of milk in the mixing process. The creamier the mac is, the better. Lieberman suggests you add in a half cup of ranch dressing to your boxed mac & cheese: it’s thick and creamy, which will make for a decadent bite you would normally only get from homemade versions. Plus, the seasonings and spices in the ranch help in the flavor department. If ranch dressing isn’t for you, try marinara sauce. It makes what she calls a “blush mac & cheese” which sounds pretty fancy to us. To make it even gooier, throw in some cream cheese. If you want to add in some more real cheese, shred some fontina or gouda and fold it into the mixture. They are more intensely-flavored cheeses, so mixing it with that cheese packet will give the dish more depth. Once you’ve upgraded to cooking items that actually need to be refrigerated, your first serious attempt at preparing meat will likely be the chicken breast. This cut of poultry is so unforgiving, especially to new cooks -- it’s dry, easy to overcook, and honestly, just sort of boring. But we can fix all that. Nearly any recipe that calls for chicken breasts can be subbed in with a thigh instead. And if preparing bone-in meat is a bit too advanced for you, you can always take it out yourself, and save cash on the upcharge for buying boneless chicken thighs in the store. Flip the chicken skin side down, then use kitchen shears to cut through the meat on both sides of the bone. Voila, you just saved yourself $2. Now, on to cooking them. The best way to prepare thighs is also incredibly simple: spice them up with your favorite combo (sage is always a safe bet for chicken, but you can feel free to get creative here). Tip: take a minute to work the herbs under the skin , where they’ll flavor the meat much better. Thighs will produce their own juice and fat, but you can add a little zing with a splash of white wine. (Save the pan liquid. You can steam/sear your veggie sides in it for maximum flavor.) Toss them in a cast iron skillet with the lid on, in a low oven (200-250 degrees) for about an hour. In the last fifteen minutes, take the lid off to let it dry a bit, and turn up the heat in the final five for crispier skin. The result is super tender, flavorful chicken, and a dish that you could impress a date (or even your parents!) with. Making a peanut butter and jelly sandwich at home will set you back about 40 cents. And because you’re not breaking the bank on whipping one up, Holly Matthews, owner of Denver’s Hey PB&J food truck, suggests you get creative with this classic. Pair some fresh fruit with your jelly to really bring out its flavors. A few slices of fresh strawberry on top of strawberry jam will make the flavors pop (plus you’ll get some healthy vitamins.) But, if you want to make things interesting, you can pick a fresh fruit that complements the flavors of the jam, like blueberry jam with slices of fresh peaches. Don’t be afraid to add a few savory elements to a PB&J. At Hey PB&J, Matthews’s menu features PB&J with everything from fried chicken to pulled pork tossed inside. A simple one to recreate is peanut butter, blackberry jam, cream cheese, jalapenos, and applewood smoked bacon. Her only rule about making additions to PB&J? Stick to white bread, and for the sake of all that is holy, cut the sandwich diagonally. Eggs are the cheapest, easiest breakfast food you can keep in your kitchen -- but that doesn’t mean you have to reserve them for breakfast only. If you have an egg or two, you have a full blown meal at the ready. (Which explains why every grocery store runs out of them before a snowstorm). There’s a few tricks to these staples, too. Make sure your eggs are fresh. According to Jim Dunleavy, director of food and beverage at Eatzi’s Market & Bakery in Dallas, egg shells are actually porous, and they can pick up weird, stale fridge smells if you let them sit too long. When it comes to preparing eggs, the quickest way to do it is with a scramble. (And it’s probably the first dish you should learn how to make without looking at a recipe.) While adding in a splash of milk is a good trick to get your scrambled eggs fluffy, if you want some serious flavor, and a borderline deluxe bite, keep some creme fraiche around and add that instead. Also, avoid over salting eggs when you’re throwing in salt and pepper -- it can break your eggs down, and make them watery. If you want a truly opulent mouthfeel, add in something like shaved truffle or smoked salmon, Dunleavy adds. If you don’t have such luxuries, snip some chives with kitchen shears and stir into the eggs before cooking them. The result is a brunch-worthy scramble, without having to wait an hour for a table on Sunday morning. Keep some champagne and OJ around, and you’re the best brunch host in town. If you’ve got a box of spaghetti lying around your pantry (even if your “pantry” is one shelf in a cabinet that also contains exactly two dishes, one bowl and three coffee mugs) you are about 15 minutes away from having a home-cooked dinner. And the difference between your dorm room spaghetti and the dishes that grace Italian holiday dinners is all in how you prep the stuff. The simplest upgrade is to make sure you salt the water, about 1 1/2 tbs of salt for every pound of pasta you’re cooking, to ensure the pasta is flavored properly. Also, make sure you throw that in once the water has already started to boil -- if you do it beforehand, you’ll risk oxidizing your pot. Phase 2: Stir, baby, stir! If you find yourself with pasta that’s always clumping together, make sure you give it a stir in the first minute of cooking -- this is when the pasta will be at it’s starchiest, and extra starchiness on the spaghetti will lead to pieces sticking together if you don’t stir. To add even more flavor to your spaghetti while it’s in the pot, chop up some onions and garlic, and toss the peels in the water before it starts to boil. You’ll get a subtle aromatic flavor, and you won’t be wasting any of your ingredients, making your Italian grandma really, really proud. They should float for easy removal before you drain the pasta. To kick up your hot dog toppings quickly, mix a tad of harissa paste with your plain old ketchup for an extra kick. The result is a hot dog with way more flavor and you feeling like you actually made dinner, when you really just microwaved it. Make a few diagonal cuts in the dogs, then sear them in a pan on the stove with a pat of butter. It won’t have the exact same smoky taste as a traditional grill, but the cuts will allow the hot dogs to pick up that extra buttery flavor, and a bit of char from the pan will do in a pinch. You may even start daydreaming of summer barbecues. This may sound a bit extreme, but one of the best toppings for a hot dog is actually another item from this list, says Chef Keith Williamson, of Tampa’s Datz, a deli turned gastropub. It’s mac & cheese. He serves a similar item at Datz, called the MacDill Dog, but tops it with jalapeno and bacon, too. Nothing makes you feel more like a grown up than prepping your own lunch -- and a healthy one at that. But, let’s face it, without a lot of thought put into them, salads can be sort of depressing. The simplest way to upgrade your salad is to mix up your greens: that means tossing some baby spinach with some kale, or adding in some arugula for extra bite. To your average carnivore, greens may all “taste the same” -- but Dunleavy begs to differ. 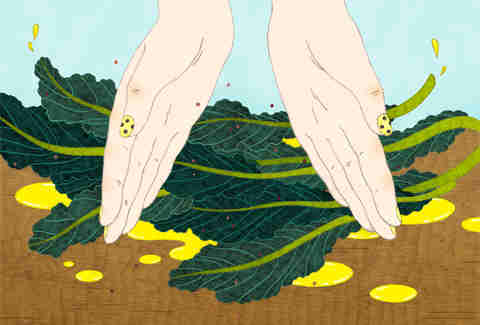 Radicchio, endive, and kale are bitter, while arugula is peppery, and butter lettuce is sweet. Soon enough you’ll notice the difference. Your mouth loves variety in texture and taste, so don’t disappoint. Adding in some fresh herbs, like basil, mint, or chives, something crunchy (toasted pumpkin seeds, or even tortilla chips) and a sweet touch, like blueberries, will also make your salad something to look forward to. First things first, step away from the freezer section. While grinding your own meat for burgers is definitely the “honors” class of home cooking, you at least need to be making your own patties. Head over to the butcher section of the grocery store, and look for an 80-20 ground beef to fat mixture. Don’t bother with any packages that have a lower fat-to-beef ratio -- you need the fat to help your burgers bind. Fattier ground beef will make for more tasty burgers, too. When it comes to adding in spices and herbs, less is definitely more. Your burgers don’t need much, and they definitely don’t need breadcrumbs and eggs, because you’re not making meatloaf. And when it comes to seasoning with salt, make sure you add it on top AFTER your patties are formed. Mixing it in with the ground beef while you form the patties will actually cause the protein to start to break down, and begin meshing before you even get them on the stovetop. The older you get, the more annoying... um, vegetarian friends you wind up with. But they should also steer clear of the freezer aisle, says Executive Chef Josh Sauer of Avenue, a contemporary brasserie in Long Branch, NJ. Sauer’s in-house veggie burger contains black beans, kale, and quinoa -- a mix he says is the easiest to recreate at home. Use chopped kale, canned black beans, and pre-ground oats to save time on prepping ingredients. While you aren’t exactly going to eat popcorn for dinner (well, at least not on the regular) it’s one of those staple snacks you should know how to kick up a notch. Especially in those instances when you have no choice BUT to eat popcorn for dinner. Like when it’s the season premiere of Game of Thrones. In times like that, Chef Maneet Chauhan from Chauhan Ale & Masala House in Nashville says you should look to your spice cabinet. Cajun spices will add a ton of flavor to your popcorn, while smoked salt will give it just a slight kick. And if you want to go spicy, chaat masala will do, just keep a glass of water nearby. You don’t need an air popper, or even a microwave, to make popcorn. It’s easy to make on the stove top, but can be a little scary (Stuff actually pops at you in hot oil, so we get it.) To keep from feeling like a nervous wreck, avoid dumping the whole batch of kernels into the hot oil at once and praying it’s the right temperature to start popping. Instead, heat up a tablespoon of oil with just three kernels of popcorn in it. Wait for the first one to pop, then add in the rest. Gauging the right temperature this way ensures the kernels aren’t cooking while the oil comes to temperature. Lightly jiggle the pot throughout for faster/more effective popping, and use a glass lid if you have one so you can see the popcorn’s progress. You can also sub out the standard vegetable oil for different flavored oils, says Matthieu Kohlmeyer, CEO and Founder of La Tourangelle, an artisanal oil producer in California. And we’re not just talking olive oil (although, that’s also delicious.) Coconut oil will help compliment the salt, and Kohlmeyer suggests using it to pop the kernels, rather than as a topping, to ensure the popcorn stays crispy.